Young families are proud to call Cordillera Ranch their home. In fact, there are over 225 Boerne ISD children living in Cordillera Ranch and another 30+ children that go to Geneva School of Boerne living in Cordillera Ranch. That’s 250+ children in our neighborhood of approximately 800+ homes. Every year more and more young families are moving into Cordillera Ranch to enjoy all that we offer, including the great access to one of San Antonio’s top school districts, Boerne ISD. Boerne ISD is an exemplary school district as it is known as one of the top school districts in the state of Texas. 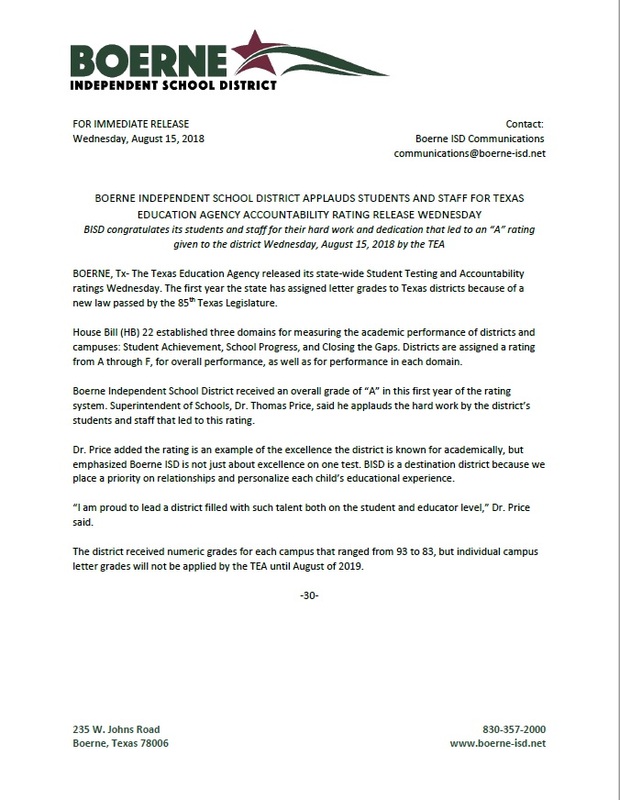 Just this year Boerne ISD received the highest rating in test scores, “A” from the TEA, for the State of Texas Assessments of Academic Readiness (STAAR). In addition, Boerne ISD was named by the NICHE ranking system as the #2 Best School District in the San Antonio Area. The Niche ranking system is based on a rigorous analysis of key statistics and reviews from students and parents. To learn more on how the ranking system works, click here. There are also great private school opportunities nearby including Geneva School of Boerne and the Montessori School, located just outside the gates of Cordillera Ranch. In fact, endless education opportunities are available for your children in Cordillera Ranch. Boerne Independent School District received the highest possible state accountability rating – “Met Standard” – for 2018. This is the highest mark in the accountability rating system by the Texas Education Agency. Contact Boerne ISD for transportation information.